Actually, the camera is moving more so than the cherry blossoms… This short video was taken from the crane last week’s picture was taken from. It’s too bad that we all couldn’t have enjoyed the cherry blossoms from this angle. This is an amateur video, you’ll hear some voices in the background but you will also be able to hear some birds singing. It was taken in the morning before the temple is open to visitors. We have entered into Golden Week here in Japan! I’m sure there will be many, many people spending their vacation days visiting temples and sites around Kyoto. 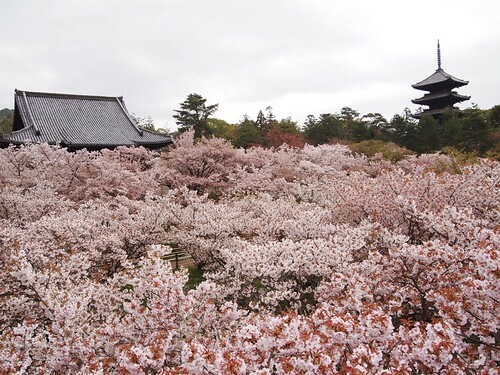 While the cherry trees are no longer in bloom, the temple grounds are covered with green and Goten and the other temple structures are as beautiful as ever. 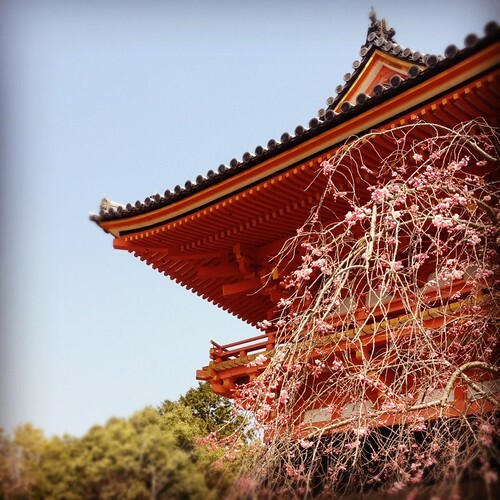 If you will be in Kyoto for Golden Week be sure to come visit Ninna-ji during your stay! 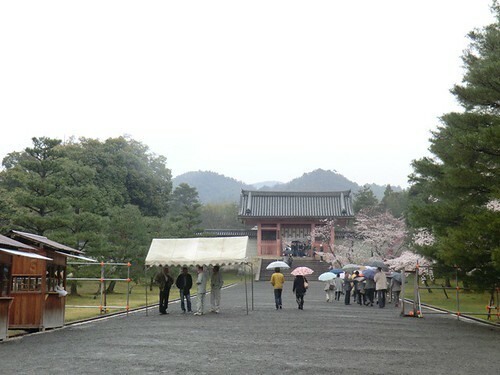 In this photo you can see Kannon-do and the Five Storied Pagoda beyond the cherry blossom field. This photo was taken from a crane, so it’s a special view that most people are not able to see! This past weekend Mayumaro came to see Ninnaji’s Omuro cherry trees in bloom! Unfortunately it was a bit rainy, but I hope he enjoyed his visit anyway! Mayumaro is the PR character for tourism in Kyoto Prefecture. He debuted just a few years ago at the Kyoto Culture Festival (国民文化祭, now an annual event in autumn every year). 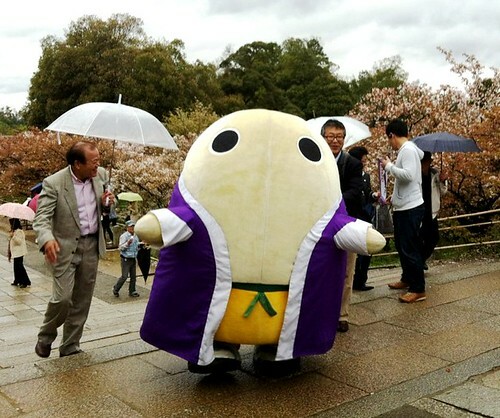 He visits all sorts of famous sites around Kyoto as well as makes appearances at events. You can see some of his adventures here or on his twitter! Some of you are probably wondering: “… What IS that thing?” Mayumaro is named and shaped after the silk cocoon (called “mayu” in Japanese) that many silk products in Kyoto are made from. Japan likes to have cute characters for all sorts of things, though making a character out of a cocoon is pretty unconventional. 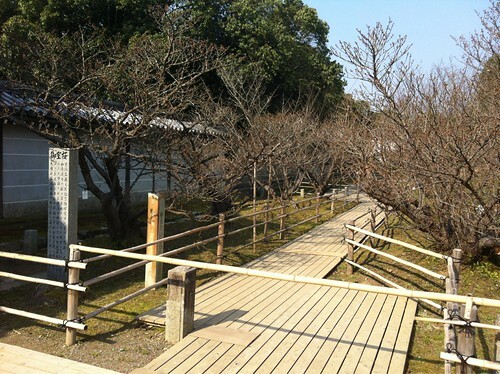 As explained in this post, in order to make sure people far into the future can enjoy the Omuro Cherry Blossoms, there has been a project to clone and create a younger generation of cherry trees. The first sapling was planted not too long ago, but it is difficult to see because it is planted in the middle of the orchard. But I was able to get this picture to share! It doesn’t look like much, but this is one of the trees that will make sure Omuro Cherries can be enjoyed for generations to come. If you visit during the Cherry Blossom Festival keep an eye out for this little tree while you enjoy the blossoms! The Cherry Blossom Festival Begins! 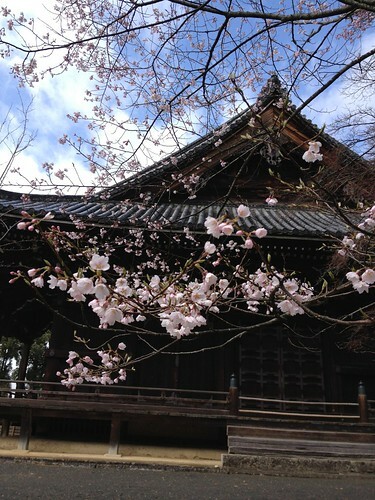 Every year the Cherry Blossom Festival at Ninna-ji is scheduled to coincide with the bloom of the Omuro cherry trees. This year’s Festival starts tomorrow, April 14th! The Omuro cherries should be coming into full bloom in the next few days, but weather is always an important factor in the speed and longevity of the blossoms. There were already some stalls out near the east gate last week! They offer a variety of souvenirs and tasty snacks. Preparations were carried on earlier this week, even in the rain! There was no time to waste! 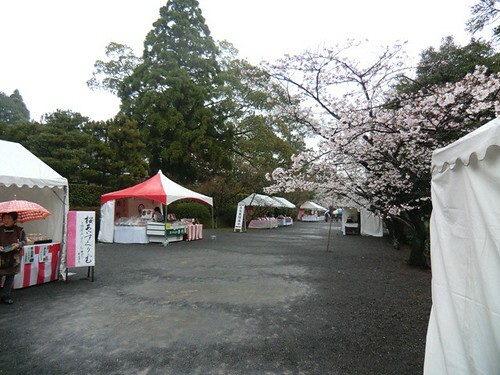 Starting tomorrow visitors coming to see the cherry blossoms will buy their tickets at the little booths to the left and proceed along the path through the Middle Gate. I hope many visitors will be able to come see the Omuro cherry trees in bloom this year! The Omuro cherry trees are not the only cherry trees here at the temple. This makes it a little more complicated to answer the many, many phone calls made to the temple every spring about if the cherry trees have bloomed yet. Everyone wants to see the cherry blossoms at their most beautiful, but which cherries?? Just to make things clear we are sure to describe the state of each type. Some of the other cherries trees are already in or near full bloom! But the late-blooming Omuro cherries are true to their name and the buds are just now beginning to open. We project that they will be blooming nicely by next week! Let’s hope for warm sunny weather so everyone can enjoy the blossoms as long as possible! In the News: Omuro Cherry Tree has been cloned! 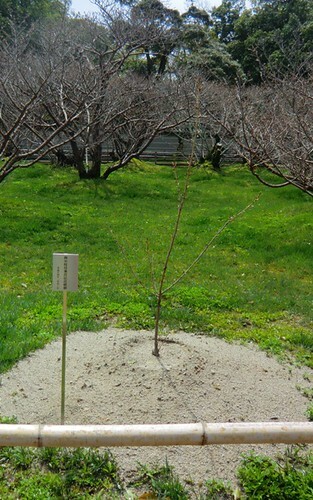 Recently Ninna-ji was in the news (see the article here) for planting a new Omuro Cherry tree in the orchard! The orchard is filled with about 13o trees and the oldest trees are over 360 years old. Some of the trees have been showing signs of aging and damage, so the temple has been coordinating with outside resources to develop ways to maintain the Omuro Cherries since 2007. Just a few days ago a sapling cloned from the existing trees was planted in the orchard. It won’t bloom until next spring, but we have high hopes that it will be hardy and bloom with beautiful cherry blossoms! The temple plans to plant around 50 more of these cloned saplings in the near future.